As the sensors in mobile devices continue to rapidly evolve, there are increasing possibilities for new medical information technology that help people live healthier lives and allow physicians to provide more targeted care. Medtronic: In 2016, Samsung partnered with medical device manufacturer Medtronic to launch the MiniMed Connect app for Android, which lets people with diabetes view, track and share their glucose levels from their smartphones. In a study of 2,800 MiniMed Connect app users, the average user reported two fewer severe low blood sugar events and 41 fewer severe high blood sugar events in a year. Last year, Samsung partnered with Medtronic again for the launch of the Intellis platform — an FDA-approved implantable pain management device that can be programmed wirelessly via a Samsung Galaxy tablet. The platform records and tracks patient activity around the clock and delivers this data to the physician, who can modify the pain-relieving vibrations from the Intellis device. Dexcom: Last year, the FDA approved the Dexcom G5 CGM mobile app for Android devices. As an option for managing patient data, it gives diabetics real-time insights into their blood glucose levels. A small sensor implanted just under the skin checks the user’s glucose levels every five minutes and sends this data to a smartphone. This way, users can see whether their glucose levels are trending up or down, and make informed decisions about their food intake and insulin doses. Reemo Health: Reemo’s remote monitoring platform runs on a Samsung Gear smartwatch, enabling users to have freedom and security outside of the hospital. The device tracks the user’s movement, heart rate, location, and enables one-button 911 calls. It also records the wearer’s quality of movement, sleep patterns and other relevant health data, so that care providers and family members can spot negative health trends and intervene before there’s an emergency. 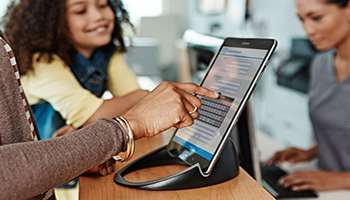 Homecare Homebase (HCHB): The HCHB platform, which is delivered on Samsung tablets, allows home health workers to access and update digital health records right from the patient’s bedside. The home office gets real-time access to that data, and because workers can always access up-to-date patient information, they can deliver better, more individualized care. By streamlining workflows and reducing the need for after-hours documentation, the solution also boosts worker productivity and satisfaction. TigerText: In busy hospitals, nurses and medical staff must always have the most up-to-date information and messages. That’s why Samsung has partnered with TigerText, a provider of real-time communications software for healthcare, to deliver an all-in-one solution that centralizes communications and data from various systems into one highly secure, mobile-centric platform, which care teams can access via a Samsung smartphone or tablet. Epic Systems: Medicine has always been a data-driven field, but paper-based documentation often made it difficult for care providers to locate patient information and be certain they had the most recent data. Electronic health records (EHR) providers like Epic Systems have solved that problem, and most hospitals have now gone digital. The next step is going mobile. Epic provides mobile EHR access for clinicians through the Epic Rover app and to patients through the MyChart Bedside app, both of which are available for Samsung mobile devices. mProve: High dropout rates often threaten to derail clinical drug trials, which can compromise pharmaceutical companies’ ability to get FDA approval for new medications. To help improve retention, mProve offers mobile healthcare data solutions that boost patient engagement in clinical trials. Using the mProve platform, pharmaceutical companies can tailor the required information, patient reminders and reading materials for each trial. Then participants use mProve’s mPal app to capture and document data using a smartphone with Samsung Knox for defense-grade security. Integron: An IoT managed services company, Integron helps pharmaceutical companies streamline the process of deploying, managing and securing wearable and mobile devices for clinical trials. Integron is currently working with Samsung and mProve on a five-year drug trial that spans several countries and includes 1,500 patients. By working with medical device and healthcare companies, Samsung is continuing its mission to support patients and professionals throughout all stages of care. With the latest mobile technology, users can have a streamlined healthcare experience — both in and out of the hospital. Explore cutting-edge healthcare technology in more depth by checking out our full line of healthcare solutions.